Living with an addict (including alcoholics) can feel like life in a war zone. The addict’s personality changes caused by addiction create chaos. Family dynamics are organized around the substance abuser, who acts like a tyrant, denying that drinking or using is a problem, while issuing orders and blaming everyone else. To cope and avoid confrontations, typically, family members tacitly agree to act as if everything is normal, not make waves, and not mention addiction. Family members deny what they know, feel, and see. This all takes a heavy psychological toll, often causing trauma, especially on those most vulnerable, the children. Yet more than half are in denial that they have an addicted parent. In families with addiction, parenting is unreliable, inconsistent, and unpredictable. There never is a sense of safety and consistency, allowing children to thrive. The majority suffer emotional, if not physical abuse, and thus carry issues of trust and anger about their past, sometimes directed at the sober parent, as well. In some cases, the sober parent is so stressed that he or she is more impatient, controlling, and irritable than the alcoholic, who may have withdrawn from family life. 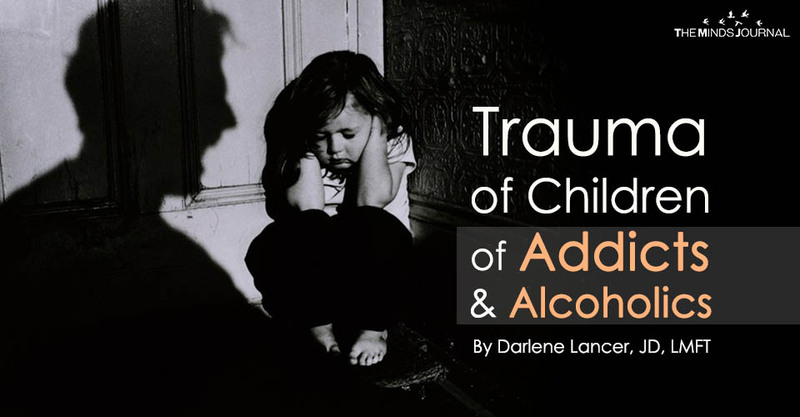 The children may blame the sober parent for neglecting their needs or not protecting them from abuse or unfair decrees issued by the alcoholic. In high conflict couples, both parents are emotionally unavailable. Children’s needs and feelings get ignored. They may be too embarrassed to entertain friends and suffer from shame, guilt, and loneliness. Many learn to become self-reliant and needless to avoid anyone having power over them again. Because an addict’s behavior is erratic and unpredictable, vulnerability and authenticity required for intimate relationships are considered too risky. Children live in continuous fear and learn to be on guard for signs of danger, creating constant anxiety well into adulthood. Many become hypervigilant and distrustful and learn to contain and deny their emotions, which are generally shamed or denied by parents. In the extreme, they may be so detached that they’re numb to their feelings. The environment and these effects are how codependency is passed on – even by children of addicts who aren’t addicts themselves. The Hero. The hero is usually the eldest child and most identified with a parental role, often helping with parental duties. Heroes are responsible and self-reliant. They sacrifice and do the right thing to keep calm. They make good leaders, are successful, but often anxious, driven, controlled, and lonely. The Adjuster. The adjuster doesn’t complain. Rather than be in charge like the hero, the adjuster tries to fit in and adapt. Thus, as adults, they have difficulty taking charge of their life and pursuing goals. The Placater. The placater is the most sensitive to others’ feelings and tries to meet others’ emotional needs, but neglects their own. They also must discover their wants and needs and learn to pursue their goals. The Scapegoat. The scapegoat acts out negative behavior to distract the family from the addict and to express feelings he or she can’t communicate. Some scapegoats turn to addiction, promiscuity, or other acting-out behavior to distract themselves and manage their emotions. When they’re in trouble, it unites the parents around a common problem.